Quechua (/ˈkɛtʃuə/, US also /ˈkɛtʃwɑː/; Spanish: [ˈketʃwa]), usually called Runasimi ("people's language") in Quechuan languages, is an indigenous language family spoken by the Quechua peoples, primarily living in the Peruvian Andes and highlands of South America. Derived from a common ancestral language, it is the most widely spoken language family of indigenous peoples of the Americas, with a total of probably some 8–10 million speakers. Approximately 25% (7.7 million) of Peruvians speak a Quechuan language. It is perhaps most widely known for being the main language family of the Inca Empire. The Spanish colonisers initially encouraged its use, but from the middle of their reign they suppressed it. However, Quechua ultimately survived and variants are still widely spoken today. Throughout the central Andes Mountains including Argentina, Bolivia, Colombia, Ecuador, Peru. Quechua had already expanded across wide ranges of the central Andes long before the expansion of the Inca Empire. The Inca were one among many peoples in present-day Peru who already spoke a form of Quechua. In the Cusco region, Quechua was influenced by neighboring languages such as Aymara, which caused it to develop as distinct. In similar ways, diverse dialects developed in different areas, borrowing from local languages, when the Inca Empire ruled and imposed Quechua as the official language. After the Spanish conquest of the Inca Empire in the 16th century, Quechua continued to be used widely by the indigenous peoples as the "common language". It was officially recognized by the Spanish administration and many Spanish learned it in order to communicate with local peoples. Clergy of the Catholic Church adopted Quechua to use as the language of evangelization. Given its use by the Catholic missionaries, the range of Quechua continued to expand in some areas. In the late 18th century, colonial officials ended administrative and religious use of Quechua, banning it from public use in Peru after the Túpac Amaru II rebellion of indigenous peoples. The Crown banned even "loyal" pro-Catholic texts in Quechua, such as Garcilaso de la Vega's Comentarios Reales. Despite a brief revival of the language immediately after the Latin American nations achieved independence in the 19th century, the prestige of Quechua had decreased sharply. Gradually its use declined so that it was spoken mostly by indigenous people in the more isolated and conservative rural areas. Nevertheless, in the 21st century, Quechua language speakers number 8 to 10 million people across South America, the most speakers of any indigenous language. The oldest written records of the language are by missionary Domingo de Santo Tomás, who arrived in Peru in 1538 and learned the language from 1540. He published his Grammatica o arte de la lengua general de los indios de los reynos del Perú (Grammar or Art of the General Language of the Indians of the Royalty of Peru) in 1560. In 1975, Peru became the first country to recognize Quechua as one of its official languages. Ecuador conferred official status on the language in its 2006 constitution, and in 2009, Bolivia adopted a new constitution that recognized Quechua and several other indigenous languages as official languages of the country. The major obstacle to the usage and teaching of Quechuan languages is the lack of written materials in the languages, such as books, newspapers, software, and magazines. The Bible has been translated into Quechua and is distributed by certain missionary groups. Quechua, along with Aymara and minor indigenous languages, remains essentially a spoken language. In recent years, Quechua has been introduced in intercultural bilingual education (IBE) in Bolivia, Ecuador and Peru. Even in these areas, the governments are reaching only a part of the Quechua-speaking populations. Some indigenous people in each of the countries are having their children study in Spanish for the purposes of social advancement. Radio Nacional del Perú broadcasts news and agrarian programs in Quechua for periods in the mornings. Quechua and Spanish are now heavily intermixed in much of the Andean region, with many hundreds of Spanish loanwords in Quechua. Similarly, Quechua phrases and words are commonly used by Spanish speakers. In southern rural Bolivia, for instance, many Quechua words such as wawa (infant), misi (cat), waska (strap or thrashing), are as commonly used as their Spanish counterparts, even in entirely Spanish-speaking areas. Quechua has also had a profound influence on other native languages of the Americas, such as Mapuche. The number of speakers given varies widely according to the sources. The total in Ethnologue 16 is 10 million, mostly based on figures published 1987–2002, but with a few dating from the 1960s. The figure for Imbabura Highland Quechua in Ethnologue, for example, is 300,000, an estimate from 1977. The missionary organization FEDEPI, on the other hand, estimated one million Imbabura dialect speakers (published 2006). Census figures are also problematic, due to under-reporting. 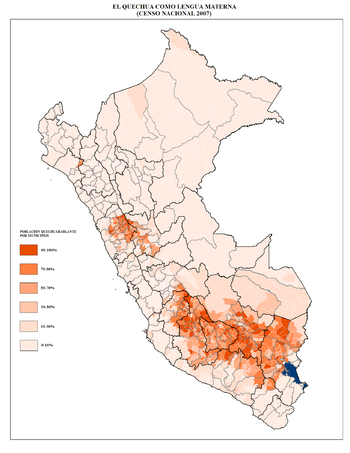 The 2001 Ecuador census reports only 500,000 Quechua speakers, compared to the estimate in most linguistic sources of more than 2 million. The censuses of Peru (2007) and Bolivia (2001) are thought to be more reliable. Additionally, there are an unknown number of speakers in emigrant communities, including Queens, New York, and Paterson, New Jersey, in the United States. There are significant differences among the varieties of Quechua spoken in the central Peruvian highlands and the peripheral varieties of Ecuador, as well as those of southern Peru and Bolivia. They can be labeled Quechua I (or Quechua B, central) and Quechua II (or Quechua A, peripheral). Within the two groups, there are few sharp boundaries, making them dialect continua. But, there is a secondary division in Quechua II between the grammatically simplified northern varieties of Ecuador, Quechua II-B, known there as Kichwa, and the generally more conservative varieties of the southern highlands, Quechua II-C, which include the old Inca capital of Cusco. The closeness is at least in part because of the influence of Cusco Quechua on the Ecuadorean varieties in the Inca Empire. Because Northern nobles were required to educate their children in Cusco, this was maintained as the prestige dialect in the north. Speakers from different points within any of the three regions can generally understand one another reasonably well. There are nonetheless significant local-level differences across each. (Wanka Quechua, in particular, has several very distinctive characteristics that make the variety more difficult to understand, even for other Central Quechua speakers.) Speakers from different major regions, particularly Central or Southern Quechua, are not able to communicate effectively. The lack of mutual intelligibility among the dialects is the basic criterion that defines Quechua not as a single language, but as a language family. The complex and progressive nature of how speech varies across the dialect continua makes it nearly impossible to differentiate discrete varieties; Ethnologue lists 45 varieties which are then divided into two groups; Central and Peripheral. Due to the non-intelligibility among the two groups, they are all classified as separate languages. As a reference point, the overall degree of diversity across the family is a little less than that of the Romance or Germanic families, and more of the order of Slavic or Arabic. The greatest diversity is within Central Quechua, or Quechua I, which is believed to lie close to the homeland of the ancestral Proto-Quechua language. Alfredo Torero devised the traditional classification, the three divisions above, plus a fourth, a northern or Peruvian branch. The latter causes complications in the classification, however, as the northern dialects (Cajamarca–Cañaris, Pacaraos, and Yauyos–Chincha) have features of both Quechua I and Quechua II, and so are difficult to assign to either. Quechua I or Quechua B, aka Central Quechua or Waywash, spoken in Peru's central highlands and coast. The most widely spoken varieties are Huaylas, Huaylla Wanca, and Conchucos. Yungay (Yunkay) Quechua or Quechua II A, spoken in the northern mountains of Peru; the most widely spoken dialect is Cajamarca. The most widely spoken varieties in this group are Chimborazo Highland Quichua and Imbabura Highland Quichua. Southern Quechua or Quechua II C, spoken in Bolivia, southern Peru, Chile, and Argentina. The most widely spoken varieties are South Bolivian, Cusco, Ayacucho, and Puno (Collao). Landerman (1991) does not believe a truly genetic classification is possible and divides Quechua II so that the family has four geographical–typological branches: Northern, North Peruvian, Central, and Southern. He includes Chachapoyas and Lamas in North Peruvian Quechua so Ecuadorian is synonymous with Northern Quechua. Quechua I (Central Quechua, Waywash) is spoken in Peru's central highlands, from the Ancash Region to Huancayo. It is the most diverse branch of Quechua, to the extent that its divisions are commonly considered different languages. II-C: Southern Quechua, in the highlands further south, from Huancavelica through the Ayacucho, Cusco, and Puno regions of Peru, across much of Bolivia, and in pockets in north-western Argentina. It is the most influential branch, with the largest number of speakers and the most important cultural and literary legacy. Quechua shares a large amount of vocabulary, and some striking structural parallels, with Aymara, and the two families have sometimes been grouped together as a "Quechumaran family". That hypothesis is generally rejected by specialists, however. The parallels are better explained by mutual influence and borrowing through intensive and long-term contact. Many Quechua–Aymara cognates are close, often closer than intra-Quechua cognates, and there is little relationship in the affixal system. A number of Quechua loanwords have entered English via Spanish, including coca, condor, guano, jerky, llama, pampa, poncho, puma, quinine, quinoa, vicuña, and, possibly, gaucho. The word lagniappe comes from the Quechuan word yapay ("to increase; to add") with the Spanish article la in front of it, la yapa or la ñapa in Spanish. The influence on Latin American Spanish includes such borrowings as papa for "potato", chuchaqui for "hangover" in Ecuador, and diverse borrowings for "altitude sickness", in Bolivia from Quechuan suruqch'i to Bolivian sorojchi, in Ecuador and Peru soroche. A rare instance of a Quechua word being taken into general Spanish use is given by carpa for "tent" (Quechua karpa). In Bolivia, particularly, Quechua words are used extensively even by non-Quechua speakers. These include wawa (baby, infant), ch'aki (hangover), misi (cat), juk'ucho (mouse), q'omer uchu (green pepper), jacu ("lets go"), chhiri and chhurco (curly haired), among many others. Quechua grammar also enters Bolivian Spanish, such as the use of the suffix -ri. In Bolivian Quechua, -ri is added to verbs to signify an action is performed with affection or, in the imperative, as a rough equivalent to please. In Bolivia -ri is often included in the Spanish imperative to imply "please" or to soften commands. For example, the standard "pásame" (pass me), becomes pasarime. Quechua has borrowed a large number of Spanish words, such as piru (from pero, but), bwenu (from bueno, good), iskwila (from "escuela," school), waka (from "vaca," cow) and burru (from burro, donkey). At first, Spaniards referred to the language of the Inca empire as the lengua general, the general language. The name quichua was first used in 1560 by Domingo de Santo Tomás in his Grammatica o arte de la lengua general de los indios de los reynos del Perú. It is not known what name the native speakers gave to their language before colonial times and whether it was Spaniards who called it quechua. There are two possible etymologies of Quechua as the name of the language. There is a possibility that the name Quechua was derived from *qiĉ.wa, the native word which originally meant the "temperate valley" altitude ecological zone in the Andes (suitable for maize cultivation) and to its inhabitants. Alternatively, Pedro Cieza de León and Inca Garcilaso de la Vega, the early Spanish chroniclers, mention the existence of a people called Quichua in the present Apurímac Region, and it could be inferred that their name was given to the entire language. The Hispanicised spellings Quechua and Quichua have been used in Peru and Bolivia since the 17th century, especially after the Third Council of Lima. Today, the various local pronunciations of "Quechua Simi" include [ˈqʰeʃwa ˈsimi], [ˈχetʃwa ˈʃimi], [ˈkitʃwa ˈʃimi], and [ˈʔitʃwa ˈʃimi]. Another name that native speakers give to their own language is runa simi, "language of man/people"; it also seems to have emerged during the colonial period. The description below applies to Cusco Quechua; there are significant differences in other varieties of Quechua. Quechua only has three vowel phonemes: /a/ /i/ and /u/, as in Aymara (including Jaqaru). Monolingual speakers pronounce them as [æ, ɪ, ʊ] respectively, but Spanish realizations [ä, i, u] may also be found. When the vowels appear adjacent to uvular consonants (/q/, /qʼ/, and /qʰ/), they are rendered more like [ɑ], [ɛ] and [ɔ], respectively. Voicing is not phonemic in the Quechua native vocabulary of the modern Cusco variety. About 30% of the modern Quechua vocabulary is borrowed from Spanish, and some Spanish sounds (such as /f/, /b/, /d/, /ɡ/) may have become phonemic even among monolingual Quechua-speakers. Cusco Quechua, North- and South-Bolivian Quechua are the only varieties of Quechua to have glottalized consonants, and they, along with certain kinds of Ecuadorian Kichwa, are the only varieties with aspirated consonants. Because reflexes of a given Proto-Quechua word may have different stops in neighboring dialects (Proto-Quechua čaki 'foot' becomes č’aki and čaka 'bridge' becomes čaka), they are thought to be innovations in Quechua from Aymara, borrowed independently after branching off from Proto-Quechua. Gemination of the tap /ɾ/ results in a trill [r]. Stress is penultimate in most dialects of Quechua. In some varieties, factors such as apocope of word-final vowels may cause exceptional final stress. Quechua has been written using the Roman alphabet since the Spanish conquest of the Inca Empire. However, written Quechua is rarely used by Quechua speakers because of the lack of printed material in Quechua. Until the 20th century, Quechua was written with a Spanish-based orthography, for example Inca, Huayna Cápac, Collasuyo, Mama Ocllo, Viracocha, quipu, tambo, condor. This orthography is the most familiar to Spanish speakers and so has been used for most borrowings into English, which essentially always happen through Spanish. It uses w instead of hu for /w/. It distinguishes simple, ejective, and aspirated stops in dialects (such as that of the Cusco Region) that make these distinctions, e.g. the aspirated khipu above. It continues to use the Spanish five-vowel system. In 1985, a variation of this system was adopted by the Peruvian government that uses the Quechuan three-vowel system, resulting in the following spellings: Inka, Wayna Qhapaq, Qullasuyu, Mama Uqllu, Wiraqucha, khipu, tampu, kuntur. The different orthographies are still highly controversial in Peru. Advocates of the traditional system believe that the new orthographies look too foreign and believe that it makes Quechua harder to learn for people who have first been exposed to written Spanish. Those who prefer the new system maintain that it better matches the phonology of Quechua, and they point to studies showing that teaching the five-vowel system to children later causes reading difficulties in Spanish. For more on this, see Quechuan and Aymaran spelling shift. The Spanish-based orthography is now in conflict with Peruvian law. According to article 20 of the decree Decreto Supremo No 004-2016-MC, which approves regulations relative to Law 29735, published in the official newspaper El Peruano on July 22, 2016, adequate spellings of the toponyms in the normalized alphabets of the indigenous languages must progressively be proposed, with the aim of standardizing the spellings used by the National Geographic Institute (Instituto Geográfico Nacional, IGN) The IGN implements the necessary changes on the official maps of Peru. Quechua is an agglutinating language. Words are built up from basic roots followed by several suffixes each of which carry one meaning. All varieties of Quechua are very regular agglutinative languages, as opposed to isolating or fusional ones [Thompson]. Their normal sentence order is SOV (subject–object–verb). Their large number of suffixes changes both the overall meaning of words and their subtle shades of meaning. Notable grammatical features include bipersonal conjugation (verbs agree with both subject and object), evidentiality (indication of the source and veracity of knowledge), a set of topic particles, and suffixes indicating who benefits from an action and the speaker's attitude toward it, but some languages and varieties may lack some of the characteristics. In Quechua, there are seven pronouns. Quechua has two first-person plural pronouns ("we" in English). One is called the inclusive, which is used if the speaker wishes to include the addressee ("we and you"). The other form is called the exclusive, which is used when the addressee is excluded ("we without you"). Quechua also adds the suffix -kuna to the second and third person singular pronouns qam and pay to create the plural forms, qam-kuna and pay-kuna. Adjectives in Quechua are always placed before nouns. They lack gender and number and are not declined to agree with substantives. Cardinal numbers. ch'usaq (0), huk (1), iskay (2), kimsa (3), tawa (4), pichqa (5), suqta (6), qanchis (7), pusaq (8), isqun (9), chunka (10), chunka hukniyuq (11), chunka iskayniyuq (12), iskay chunka (20), pachak (100), waranqa (1,000), hunu (1,000,000), lluna (1,000,000,000,000). Ordinal numbers. To form ordinal numbers, the word ñiqin is put after the appropriate cardinal number (iskay ñiqin = "second"). The only exception is that, in addition to huk ñiqin ("first"), the phrase ñawpaq is also used in the somewhat more restricted sense of "the initial, primordial, the oldest". Noun roots accept suffixes that indicate person (defining of possession, not identity), number, and case. In general, the personal suffix precedes that of number. In the Santiago del Estero variety, however, the order is reversed. From variety to variety, suffixes may change. Adverbs can be formed by adding -ta or, in some cases, -lla to an adjective: allin – allinta ("good – well"), utqay – utqaylla ("quick – quickly"). They are also formed by adding suffixes to demonstratives: chay ("that") – chaypi ("there"), kay ("this") – kayman ("hither"). There are several original adverbs. For Europeans, it is striking that the adverb qhipa means both "behind" and "future" and ñawpa means "ahead, in front" and "past". Local and temporal concepts of adverbs in Quechua (as well as in Aymara) are associated to each other reversely, compared to European languages. For the speakers of Quechua, we are moving backwards into the future (we cannot see it: it is unknown), facing the past (we can see it: it is remembered). The suffixes shown in the table above usually indicate the subject; the person of the object is also indicated by a suffix (-a- for first person and -su- for second person), which precedes the suffixes in the table. In such cases, the plural suffixes from the table (-chik and -ku) can be used to express the number of the object rather than the subject. Various suffixes are added to the stem to change the meaning. For example, -chi is a causative and -ku is a reflexive (example: wañuy = "to die"; wañuchiy = to kill wañuchikuy = "to commit suicide"); -naku is used for mutual action (example: marq'ay= "to hug"; marq'anakuy= "to hug each other"), and -chka is a progressive, used for an ongoing action (e.g., mikhuy = "to eat"; mikhuchkay = "to be eating"). Particles are indeclinable: they do not accept suffixes. They are relatively rare, but the most common are arí ("yes") and mana ("no"), although mana can take some suffixes, such as -n/-m (manan/manam), -raq (manaraq, not yet) and -chu (manachu?, or not? ), to intensify the meaning. Other particles are yaw ("hey", "hi"), and certain loan words from Spanish, such as piru (from Spanish pero "but") and sinuqa (from sino "rather"). The parentheses around the vowels indicate that the vowel can be dropped in when following an open vowel. For the sake of cohesiveness, the above forms are used to discuss the evidential morphemes. There are dialectal variations to the forms. The variations will be presented in the following descriptions. The following sentences provide examples of the three evidentials and further discuss the meaning behind each of them. Regional variations: In Cusco Quechua, the direct evidential presents itself as –mi and –n. The evidential –mi indicates that the speaker has a "strong personal conviction the veracity of the circumstance expressed." It has the basis of direct personal experience. I saw them with my own eyes. In Quechuan languages, not specified by the source, the inference morpheme appears as –ch(i), -ch(a), -chr(a). The –chr(a) evidential indicates that the utterance is an inference or form of conjecture. That inference relays the speaker’s non-commitment to the truth-value of the statement. It also appears in cases such as acquiescence, irony, interrogative constructions, and first person inferences. These uses constitute nonprototypical use and will be discussed later in the changes in meaning and other uses section. I think they will probably come back. Regional variations: It can appear as –sh(i) or –s(i) depending on the dialect. With the use of this morpheme, the speaker "serves as a conduit through which information from another source passes." The information being related is hearsay or revelatory in nature. It also works to express the uncertainty of the speaker regarding the situation. However, it also appears in other constructions that are discussed in the changes in meaning section. (I was told) Shanti borrowed it. Hintz discusses an interesting case of evidential behavior found in the Sihaus dialect of Ancash Quechua. The author postulates that instead of three single evidential markers, that Quechuan language contains three pairs of evidential markers. The evidential morphemes have been referred to as markers or morphemes. The literature seems to differ on whether or not the evidential morphemes are acting as affixes or clitics, in some cases, such as Wanka Quechua, enclitics. Lefebvre and Muysken (1998) discuss this issue in terms of case but remark the line between affix and clitic is not clear. Both terms are used interchangeably throughout these sections. Evidentials in the Quechuan languages are "second position enclitics", which usually attach to the first constituent in the sentence, as shown in this example. Once, there were an old man and an old woman. They can, however, also occur on a focused constituent. It is now that Pedro is building the house. Sometimes, the affix is described as attaching to the focus, particularly in the Tarma dialect of Yaru Quechua, but this does not hold true for all varieties of Quechua. In Huanuco Quechua, the evidentials may follow any number of topics, marked by the topic marker –qa, and the element with the evidential must precede the main verb or be the main verb. However, there are exceptions to that rule, and the more topics there are in a sentence, the more likely the sentence is to deviate from the usual pattern. When she (the witch) reached the peak, God had already taken the child up into heaven. Evidentials can be used to relay different meanings depending on the context and perform other functions. The following examples are restricted to Wanka Quechua. The direct evidential appears in wh-questions and yes/no questions. By considering the direct evidential in terms of prototypical semantics, it seems somewhat counterintuitive to have a direct evidential, basically an evidential that confirms the speaker’s certainty about a topic, in a question. However, if one focuses less on the structure and more on the situation, some sense can be made. The speaker is asking the addressee for information so the speaker assumes the speaker knows the answer. That assumption is where the direct evidential comes into play. The speaker holds a certain amount of certainty that the addressee will know the answer. The speaker interprets the addressee as being in "direct relation" to the proposed content; the situation is the same as when, in regular sentences, the speaker assumes direct relation to the proposed information. When did he come back from Huancayo? The direct evidential affix is also seen in yes/no questions, similar to the situation with wh-questions. Floyd describes yes/no questions as being "characterized as instructions to the addressee to assert one of the propositions of a disjunction." Once again, the burden of direct evidence is being placed on the addressee, not on the speaker. The question marker in Wanka Quechua, -chun, is derived from the negative –chu marker and the direct evidential (realized as –n in some dialects). Is he going to Tarma? While –chr(a) is usually used in an inferential context, it has some non-prototypical uses. Mild Exhortation In these constructions the evidential works to reaffirm and encourage the addressee’s actions or thoughts. Yes, tell them, "I've gone farther." This example comes from a conversation between husband and wife, discussing the reactions of their family and friends after they have been gone for a while. The husband says he plans to stretch the truth and tell them about distant places to which he has gone, and his wife (in the example above) echoes and encourages his thoughts. Acquiescence With these, the evidential is used to highlight the speaker’s assessment of inevitability of an event and acceptance of it. There is a sense of resistance, diminished enthusiasm, and disinclination in these constructions. I suppose I'll pay you then. This example comes from a discourse where a woman demands compensation from the man (the speaker in the example) whose pigs ruined her potatoes. He denies the pigs as being his but finally realizes he may be responsible and produces the above example. Interrogative Somewhat similar to the –mi evidential, the inferential evidential can be found in content questions. However, the salient difference between the uses of the evidentials in questions is that in the –m(i) marked questions, an answer is expected. That is not the case with –chr(a) marked questions. I wonder what we will give our families when we arrive. Irony Irony in language can be a somewhat complicated topic in how it functions differently in languages, and by its semantic nature, it is already somewhat vague. For these purposes, it is suffice to say that when irony takes place in Wanka Quechua, the –chr(a) marker is used. (I suppose) That's how you learn [that is the way in which you will learn]. This example comes from discourse between a father and daughter about her refusal to attend school. It can be interpreted as a genuine statement (perhaps one can learn by resisting school) or as an ironic statement (that is an absurd idea). Aside from being used to express hearsay and revelation, this affix also has other uses. Because folktales, myths, and legends are, in essence, reported speech, it follows that the hearsay marker would be used with them. Many of these types of stories are passed down through generations, furthering this aspect of reported speech. A difference between simple hearsay and folktales can be seen in the frequency of the –sh(i) marker. In normal conversation using reported speech, the marker is used less, to avoid redundancy. Riddles are somewhat similar to myths and folktales in that their nature is to be passed by word of mouth. In certain grammatical structures, the evidential marker does not appear at all. In all Quechuan languages the evidential will not appear in a dependent clause. Sadly, no example was given to depict this omission. Omissions occur in Quechua. The sentence is understood to have the same evidentiality as the other sentences in the context. Quechuan speakers vary as to how much they omit evidentials, but they occur only in connected speech. An interesting contrast to omission of evidentials is overuse of evidentials. If a speaker uses evidentials too much with no reason, competence is brought into question. For example, the overuse of –m(i) could lead others to believe that the speaker is not a native speaker or, in some extreme cases, that one is mentally ill.
(Only) one’s experience is reliable. Avoid unnecessary risk by assuming responsibility for information of which one is not absolutely certain. Do not be gullible. There are many folktales in which the villain is foiled by his gullibility. Assume responsibility only if it is safe to do so. Successful assumption of responsibility builds stature in the community. Evidentials also show that being precise and stating the source of one’s information is extremely important in the language and the culture. Failure to use them correctly can lead to diminished standing in the community. Speakers are aware of the evidentials and even use proverbs to teach children the importance of being precise and truthful. Precision and information source are of the utmost importance. They are a powerful and resourceful method of human communication. Although the body of literature in Quechua is not as sizable as its historical and current prominence would suggest, it is nevertheless not negligible. As in the case of the pre-Columbian Mesoamerica, there are a number of surviving Andean documents in the local language that were written down in Latin characters after the European conquest, but they express, to a great extent, the culture of pre-Conquest times. That type of Quechua literature is somewhat scantier, but nevertheless significant. It includes the so-called Huarochirí Manuscript (1598), describing the mythology and religion of the valley of Huarochirí as well as Quechua poems quoted within the Spanish-language texts of some chronicles dealing with the pre-Conquest period. There are a number of anonymous or signed Quechua dramas dating from the post-conquest period (starting from the 17th century), some of which deal with the Inca era, while most are on religious topics and of European inspiration. The most famous dramas is Ollantay and the plays describing the death of Atahualpa. For example, Juan de Espinosa Medrano wrote several dramas in the language. Poems in Quechua were also composed during the colonial period. Dramas and poems continued to be written in the 19th and especially in 20th centuries as well; in addition, in the 20th century and more recently, more prose has been published. However, few literary forms were made present in the 19th century as European influences limited literary criticism. While some of that literature consists of original compositions (poems and dramas), the bulk of 20th century Quechua literature consists of traditional folk stories and oral narratives. Johnny Payne has translated two sets of Quechua oral short stories, one into Spanish and the other into English. Many Andean musicians write and sing in their native languages, including Quechua and Aymara. Notable musical groups are Los Kjarkas, Kala Marka, J'acha Mallku, Savia Andina, Wayna Picchu, Wara and many others. There are several Quechua and Quechua-Spanish bloggers, as well as a Quechua language podcast. The 1961 Peruvian film Kukuli was the first film to be spoken in the Quechua language. In Star Wars Episode IV: A New Hope the character Greedo's native language, Rodian, is actually a simplified version of Quechua, which is shown in conversation with Han Solo. The '90s TV series The Sentinel included numerous references to the shamanism and spirituality of the Peruvian Chopec as well as including many Quechua words in several episodes. The sport retailer Decathlon Group brands their mountain equipment range as Quechua. In Indiana Jones and the Kingdom of the Crystal Skull, Indy has a dialogue in Quechua with Peruvians. He explains he learned the language in Mexico from a couple of the "guys" he met while briefly riding with Pancho Villa. This adventure was featured in the pilot episode of The Young Indiana Jones Chronicles. The guys were most likely Peruvian mercenaries recruited to the División del Norte. In The Adventures of Tintin books The Seven Crystal Balls and its sequel Prisoners of the Sun, there are Quechua characters who are in league with the Inca and facilitate the abduction and incarceration of Professor Calculus at the Temple of the Sun for committing sacrilege by wearing the funerary bangle of Rascar Capac. In the collectible card game Yu-Gi-Oh!, monsters in the card series Earthbound Immortals have their name originated from Quechua. In the animated series, Earthbound Immortals are described as powerful beasts sealed in Nazca Lines, which each one of them represents. On the TV cartoon series The Emperor's New School, the main and other characters have Quechua names as Kuzco (Cusco, that means "navel of the world"), Pacha (ground) and Chicha (chicha is a kind of fermented maize "beer"). Ruanja, a language spoken in Mary Doria Russel's The Sparrow is based on Quechua. ^ Hammarström, Harald; Forkel, Robert; Haspelmath, Martin, eds. (2017). "Quechuan". Glottolog 3.0. Jena, Germany: Max Planck Institute for the Science of Human History. ^ "Quechua language, alphabet and pronunciation". www.omniglot.com. Retrieved 2017-07-26. ^ a b c Adelaar 2004, pp. 167–168, 255. ^ "Peru | Languages". Ethnologue. Dallas, Texas: SIL International. 2017. Retrieved 30 November 2017. A macrolanguage. Population total all languages: 7,734,620. ^ Fisher, John; Cahill, David Patrick, eds. (2008). "De la etnohistoria a la historia en los Andes : 51o Congreso Internacional de Americanistas, Santiago de Chile, 2003". Congreso Internacional de Americanistas: 295. ^ Aybar cited by Hart, Stephen M. A Companion to Latin American Literature, p. 6. ^ Torero, Alfredo (1983). "La familia lingûística quechua". América Latina en sus lenguas indígenas. Caracas: Monte Ávila. ISBN 92-3-301926-8. ^ Torero, Alfredo (1974). El quechua y la historia social andina. Lima: Universidad Ricardo Palma, Dirección Universitaria de Investigación. ISBN 978-603-45-0210-9. ^ Kandell, Jonathan Gay (May 22, 1975). "Peru officially adopting Indian tongue". New York Times. ^ Borsdorf, Axel. The Andes: A Geographical Portrait. p. 142. ^ Adelaar 2004, pp. 258–259: "The Quechua speakers' wish for social mobility for their children is often heard as an argument for not transmitting the language to the next generation.... As observed quite adequately by Cerrón Palomino, "Quechua (and Aymara) speakers seem to have taken the project of assimilation begun by the dominating classes and made it their own." ^ Claudio Torrens (2011-05-28). "Some NY immigrants cite lack of Spanish as barrier". UTSanDiego.com. Retrieved 2013-02-10. ^ Edward A. Roberts, A Comprehensive Etymological Dictionary of the Spanish Language..., 2014. ^ Muysken, Pieter. "Root/Affix asymmetries in contact and transfer: Case studies from the Andes" (PDF). www.ru.nl. ^ a b c d e Adelaar 2004, p. 179. ^ Cole 1982, p. 199. ^ To listen to recordings of these and many other words as pronounced in many different Quechua-speaking regions, see the external website The Sounds of the Andean Languages. It also has an entire section on the new Quechua and Aymara Spelling. ^ "Decreto Supremo que aprueba el Reglamento de la Ley N° 29735, Ley que regula el uso, preservación, desarrollo, recuperación, fomento y difusión de las lenguas originarias del Perú, Decreto Supremo N° 004-2016-MC". Retrieved July 10, 2017. ^ Alderetes, Jorge R. (1997). "Morfología nominal del quechua santiagueño". ^ This occurs in English, where "before" means "in the past", and Shakespeare's Macbeth says "The greatest is behind", meaning in the future. ^ Aikhenvald 2004, p. 3. ^ a b Aikhenvald 2004, p. 377. ^ Aikhenvald 2004, p. 42. ^ Floyd 1999, p. 60. ^ Floyd 1999, p. 57. ^ Floyd 1999, p. 61. ^ Floyd 1999, p. 95. ^ Floyd 1999, p. 103. ^ Floyd 1999, p. 123. ^ Floyd 1999, p. 127. ^ Hintz 1999, p. 1. ^ Lefebvre & Muysken 1998, p. 89. ^ Aikhenvald 2004, p. 68-69. ^ Weber 1986, p. 145. ^ Floyd 1999, p. 87. ^ Floyd 1999, p. 89. ^ Aikhenvald 2004, p. 72. ^ Aikhenvald 2004, p. 79. ^ Aikhenvald 2004, p. 358. ^ Aikhenvald 2004, p. 380. ^ a b Adelaar 2004, pp. 254–256. ^ "History". Homepage.ntlworld.com. Archived from the original on 2013-05-15. Retrieved 2012-11-09. ^ "Peru: The State of Quechua on the Internet · Global Voices". Global Voices. 2011-09-09. Retrieved 2017-01-02. ^ "Film Kukuli (Cuzco-Peru)". Latinos in London. Retrieved 2012-11-10. Rolph, Karen Sue. Ecologically Meaningful Toponyms: Linking a lexical domain to production ecology in the Peruvian Andes. Doctoral Dissertation, Stanford University, 2007. Adelaar, Willem F. H (2004-06-10). The Languages of the Andes. ISBN 9781139451123. Cole, Peter. "Imbabura Quechua", North-Holland (Lingua Descriptive Studies 5), Amsterdam 1982. Aikhenvald, Alexandra. Evidentiality. Oxford: Oxford UP, 2004. Print. Floyd, Rick. The Structure of Evidential Categories in Wanka Quechua. Dallas, TX: Summer Institute of Linguistics, 1999. Print. Hintz, Diane. “The evidential system in Sihuas Quechua: personal vs. shared knowledge” The Nature of Evidentiality Conference, The Netherlands, 14–16 June 2012. SIL International. Internet. 13 April 2014. Lefebvre, Claire, and Pieter Muysken. Mixed Categories: Nominalizations in Quechua. Dordrecht, Holland: Kluwer Academic, 1988. Print. Weber, David. "Information Perspective, Profile, and Patterns in Quechua." Evidentiality: The Linguistic Coding of Epistemology. Ed. Wallace L. Chafe and Johanna Nichols. Norwood, NJ: Ablex Pub, 1986. 137-55. Print. Adelaar, Willem F. H. Modeling convergence: Towards a reconstruction of the history of Quechuan–Aymaran interaction About the origin of Quechua, and its relation with Aymara, 2011. Adelaar, Willem F. H. Tarma Quechua: Grammar, Texts, Dictionary. Lisse: Peter de Ridder Press, 1977. King, Kendall A., and Nancy H. Hornberger. Quechua Sociolinguistics. Berlin: Mouton de Gruyter, 2004. Lefebvre, Claire, and Pieter Muysken. Relative Clauses in Cuzco Quechua: Interactions between Core and Periphery. Bloomington, Ind: Indiana University Linguistics Club, 1982. Parker, Gary John. Ayacucho Quechua Grammar and Dictionary. Janua linguarum. Series practica, 82. The Hague: Mouton, 1969. Wikivoyage has a travel guide for Quechua phrasebook. Quechua Collection of Patricia Dreidemie at the Archive of the Indigenous Languages of Latin America. Huancavelica Quechua Fieldnotes of Willem de Ruese, copies of handwritten notes on Quechua pedagogical and descriptive materials, from the Archive of the Indigenous Languages of Latin America. Diccionario Quechua: Español–Runasimi–English Dictionary of Ayacucho Quechua from Clodoaldo Soto Ruiz.